Question: Why does the world need another self help website? Q. What's so 'special' about SelfHelpCollective.com? Hello. 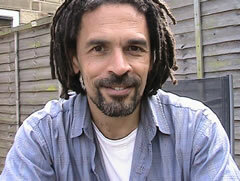 My name is Steve M Nash and this is me in 2010 – A man with dreadlocks no less! Now this type of 'professional proof' may well be important to you and if it is - professionals do have their place, after all - then this site's a good place to look: Mental Health America, as is this one Mental Health Foundation. If, however, you're someone who believes fundamentally in their own power, and in their own judgement (as I do, and as I urge you to do), then you will rely on your own judgement of what you read (at SelfHelpCollective.com) first and foremost, no matter where the 'advice' comes from. (Click to see 3 questions!) 1. Relationship? HELP here... 2. Not sure? TRUST yourself! 3. About SBI? Click! ...Because YOU know more than you think, yes you do... we ALL do! In fact, I believe that YOU are all you need! That's why, once you've helped yourself here, you're encouraged to get involved and help others, too! And, even though my journey of personal discovery has been a slooooow one at times, the personal insights I've experienced over the last 15 years or so - via life experience, reading self-help books, and other personal growth tools - have helped me understand so much more about 'the meaning of life, the universe and everything'. Enter stage left, the world of self-help and 'spirituality'... I read books, bought CDs and DVDs, watched YouTube videos - anything to help me understand myself, and thus to help me understand the world. And whilst I am less of a fan of self-help than I used to be - I believe self-help chases the symptom, and not the source - I am grateful for its part in my growth. So, yes, the Self Help Collective is about unlocking the wisdom that is inside YOU. This site aims to encourage you to use that wisdom - a collective wisdom; so who I am is not really important. Well I don't think so, anyway. Think of me as a facilitator. And if you could do a better job, or if you think you know more about a particular self-help subject, then great - get in touch and share your wisdom! because it has a song." be changed by the world." Now the funny thing about my passion for self-help, and thus why I created SelfHelpCollective.com in the first place, is that I didn't fully appreciate this interest of mine - self-improvement - until I decided to build another in a line of websites in Feb 2008. So I decided to build my next site using SiteSell's SBI! (formerly Site Build It!, now known as Solo Build It!, aimed at #SoloPreneurs) - to purchase a subscription to SBI! - and to see what website I came up with. Read my SBI! review - a one page review, including pros and cons. Overall, I believe in you (and me) to make a positive difference to your world (and mine). I believe it's important that we see ourselves for who we truly are. I believe that we should learn from others, but teach ourselves - that is why SelfHelpCollective.com exists: to offer guru-free, non-prescriptive tips and advice on self-help and personal development. If you know better, fine; if you don't agree with what your read here, fine. Share this 'about us' page - thanks!